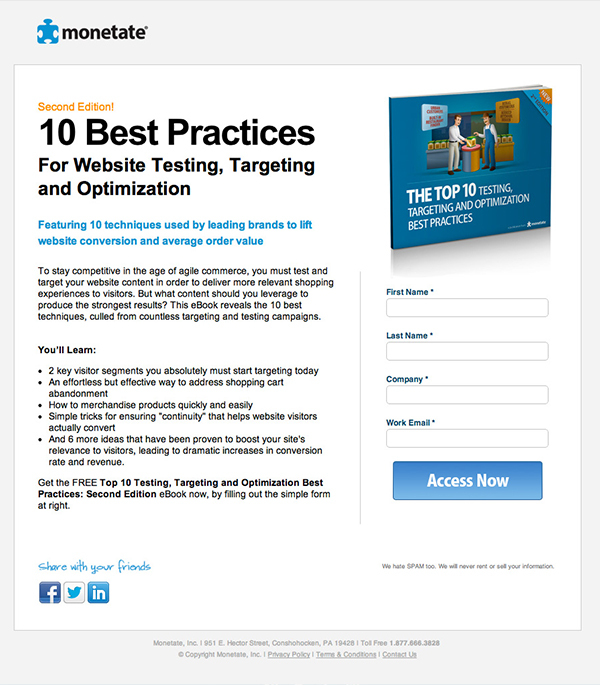 A great ebook lead gen landing page from Monetate about the 10 best practices for website testing, targeting and optimization. Design of eBook image shows professionalism: By having a nicely designed cover you show that time and effort went into it’s creation (as opposed to a boring plain white cover). Simple bullets break down why you would want the eBook: The headline for the bullets “You’ll learn” really sets the tone that it’s useful and listing what you will get out of reading it (as opposed to what’s in it) is a much stronger benefits driven approach. Clear definition in headline of what you’ll get: Sometimes it’s nice with an eBook to know it’s not War and Peace. By limiting this to 10 tips, they stand a good chance of increased conversions by providing an easy to consume resource. While long eBooks can be authoritative, they often go unread. Social sharing location: People are more inclined to share something right after they actually get it. So I’d suggest placing the social sharing buttons on the form confirmation page. This also has the benefit of removing distractions from the main page. Preview: People react well to the psychology of try-before-you-buy, so adding a preview of the eBook (first chapter or a few choice pages) would help people know what they are exchanging their personal data for.